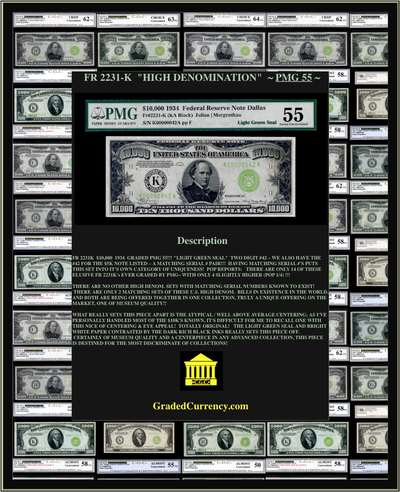 FR 2231K $10,000 1934 GRADED PMG 55!!! 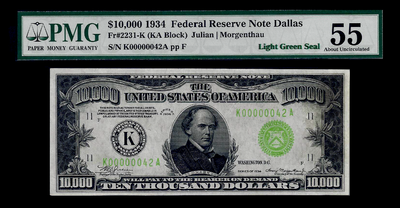 "LIGHT GREEN SEAL" TWO DIGIT #42 – WE ALSO HAVE THE #42 FOR THE $5K NOTE LISTED – A MATCHING SERIAL # PAIR!!! HAVING MATCHING SERIAL #'S PUTS THIS SET INTO IT'S OWN CATEGORY OF UNIQUENESS! 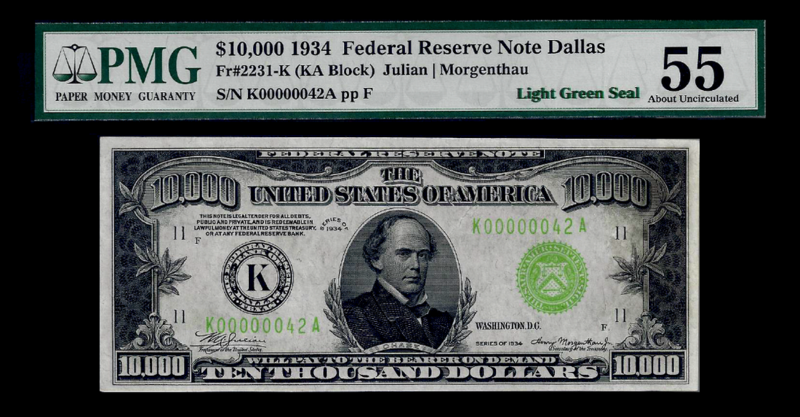 POP REPORTS: THERE ARE ONLY 14 OF THESE ELUSIVE FR 2231K's EVER GRADED BY PMG~ WITH ONLY 4 SLIGHTLY HIGHER (POP 1/4) !!! THERE ARE NO OTHER HIGH DENOM. SETS WITH MATCHING SERIAL NUMBERS KNOWN TO EXIST! THERE ARE ONLY 2 MATCHING SETS OF THESE U.S. HIGH DENOM. 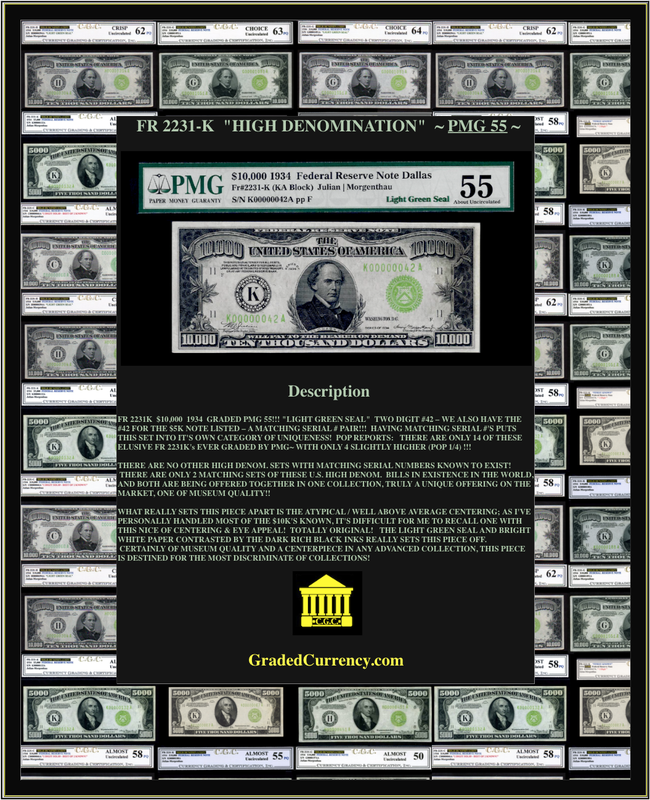 BILLS IN EXISTENCE IN THE WORLD, AND BOTH ARE BEING OFFERED TOGETHER IN ONE COLLECTION, TRULY A UNIQUE OFFERING ON THE MARKET, ONE OF MUSEUM QUALITY!! 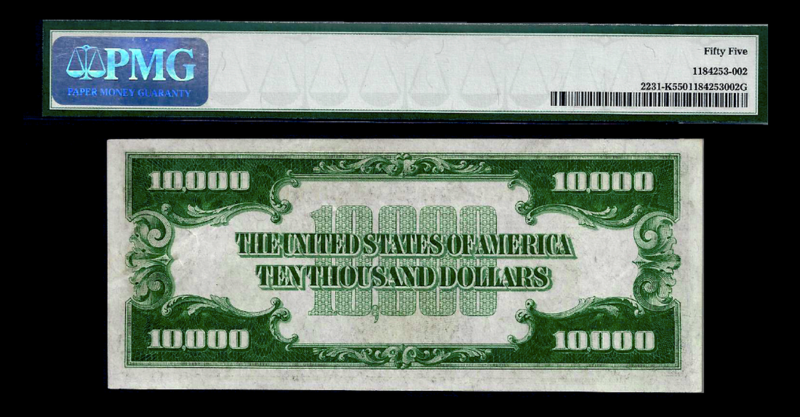 WHAT REALLY SETS THIS PIECE APART IS THE ATYPICAL / WELL ABOVE AVERAGE CENTERING; AS I'VE PERSONALLY HANDLED MOST OF THE $10K'S KNOWN, IT'S DIFFICULT FOR ME TO RECALL ONE WITH THIS NICE OF CENTERING & EYE APPEAL! TOTALLY ORIGINAL! THE LIGHT GREEN SEAL AND BRIGHT WHITE PAPER CONTRASTED BY THE DARK RICH BLACK INKS REALLY SETS THIS PIECE OFF. CERTAINLY OF MUSEUM QUALITY AND A CENTERPIECE IN ANY ADVANCED COLLECTION, THIS PIECE IS DESTINED FOR THE MOST DISCRIMINATE OF COLLECTIONS!